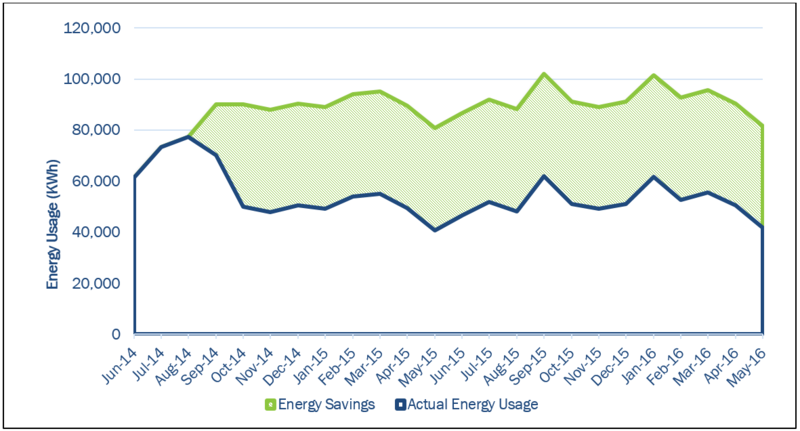 How utility bill data creates a reliable foundation for accurate energy savings. Energy efficiency projects are filled with data; facility operations, occupant behavior, equipment specifications, and utility billing data. Utility billing data forms the baseline for any energy efficiency project. The utility analysis serves as a reliable baseline throughout the project lifecycle. There are four primary uses of utility billing data: utility analysis, benchmarking, utility disaggregation, and measurement and verification (M&V). Each will be discussed in the following paragraphs. Before an in-field energy audit can be conducted, utility bills are collected and analyzed to establish the base condition for each facility included in the project. Bills are typically collected from at least the electric utility and natural gas utility. If other fossil fuels are utilized, such as propane or fuel oil, those bills would be included in the analysis. Depending on the energy procurement laws in the state where the project is located, there may be additional bills from third-party energy commodity suppliers. Ultimately, the billing data is entered and analyzed to determine the overall energy consumption and the effective unit cost of each utility for use in energy savings analyses. The values obtained from the utility analysis are then compared against comparable buildings from the Commercial Building Energy Consu mption Survey (CBECS), in an exercise known as benchmarking. 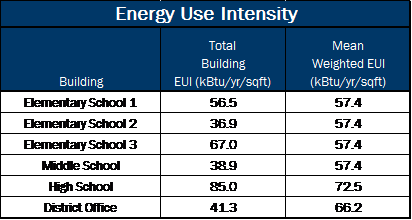 The annual consumption for each utility is converted to a common unit (typically kBtu) and normalized by the building square footage to obtain a value known as the energy use intensity (EUI). This value sets all buildings within a particular use type on a level platform for easy comparison. A higher EUI value signifies a less efficient building, having more energy consumption per square foot. High EUI buildings are typically good candidates for a deep energy retrofit project. Even buildings with average or lower EUI values may show higher EUI values for a particular fuel, which may signal opportunities are available to address building systems which utilize that fuel. Costs may also be analyzed on a per square foot basis and compared against national or regional data. This can help target the most costly fuels with applicable energy conservation measures (ECM). Lastly, the profile of energy consumption for each category of building system (lighting, HVAC, plug loads, water heating, etc.) can be developed using the national or regional CBECS data for comparable buildings. During the audit and design phases, utility data is used to continually evaluate the reasonableness of energy savings calculations. Past experience and experimental data provide typical energy savings values for particular ECMs. If calculated savings fall outside of expected values, further investigation and changes to the calculations can be made to modify the analysis for increased accuracy. The calculations are then used to separate utility consumption into energy consumption by building system, known as a utility disaggregation. The utility disaggregation is similar to the energy consumption by category profile developed during benchmarking, but instead uses building specific data and calculations rather than CBECS data. At the end of the project, depending on the contract, measurement and verification may be required. If M&V is required, utility billing data is collected for the 12-month period from project close-out through the following year. Depending on the M&V method agreed upon, energy savings can be evaluated based on utility bill savings. In other instances, the utility analysis may determine the effective unit cost to be used in calculating the achieved cost savings from measured reductions in energy consumption. Considering the many uses of utility data throughout the project lifecycle, getting the data right is paramount. Utility data is the foundational element to any energy project, critical for providing accurate baselines, benchmarks, and unit costs. This foundation, much like that of a building, must be solid to ensure a good project.